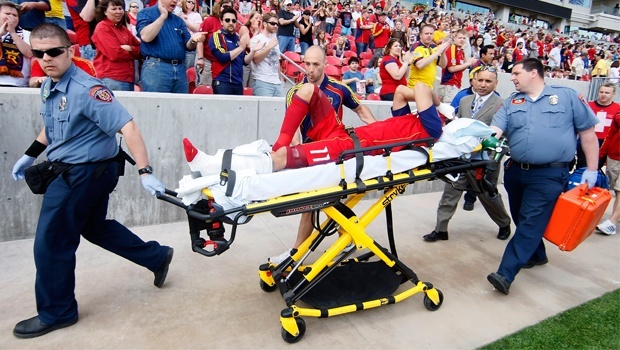 It should come to no surprise that Chivas USA striker Marcos Mondaini would be suspended for his reckless tackle on Real Salt Lake midfielder Javier Morales. The question was always going to be how long. While many folks were hoping or expecting Mondaini to get the same punishment as Colorado’s Brian Mullan, the league’s disciplinary committee thought otherwise. Today they handed out an extra three games to his red card that he received to bring his suspension up to four games, plus a fine of $1,500. Four games is still a hefty punishment in this league, one of the bigger suspension in the league’s short history too. In all honesty, the punishment is pretty fair but I know some RSL fans that will disagree. What did you make of the punishment? As an RSL fan I think it’s just. Regardless what length they gave it has no bearing on when we get Morales back. It is still a statement to the league that they won’t stand for dangerous tackles from behind, but only if they hand out similar bans for dangerous tackles from behind that don’t necessarily end in injury or even red cards.